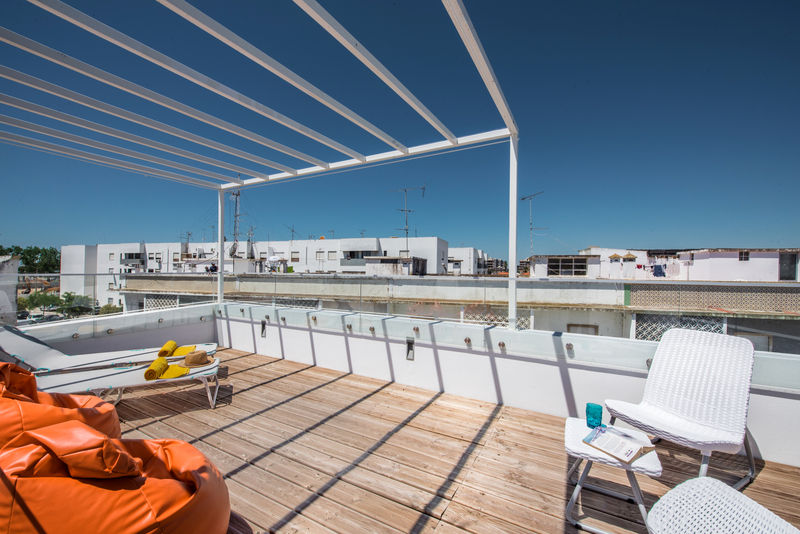 An Amazing renovated Olhao Townhouse close to the seafront with 2 bedrooms, air conditioning, wifi and two amazing roof terraces. 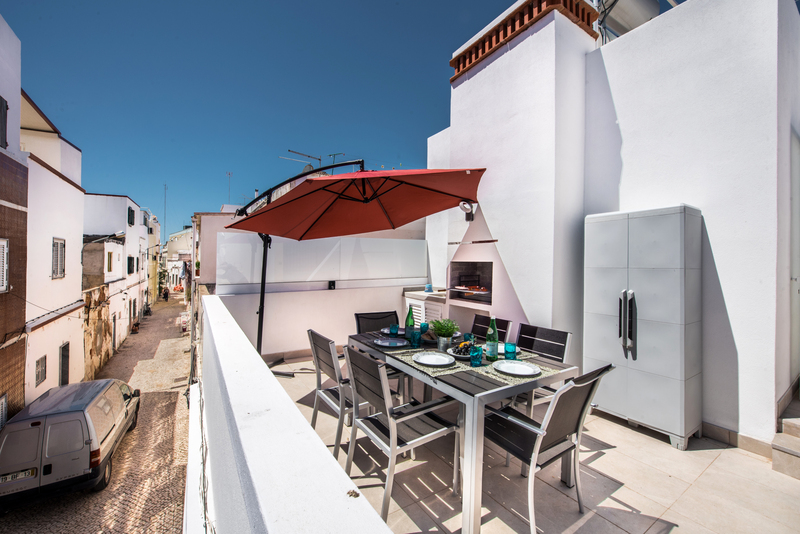 Casa Limoncello is a simply stunning renovated 3 bedroom townhouse close to the seafront and within easy reach of everything you could possibly need for a great holiday. 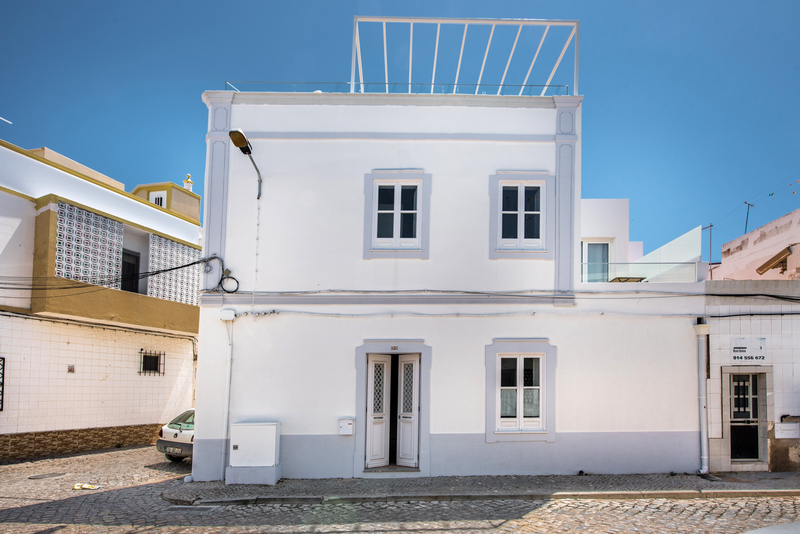 The house is typical Olhao Cubist design with a wonderful decorative facade. 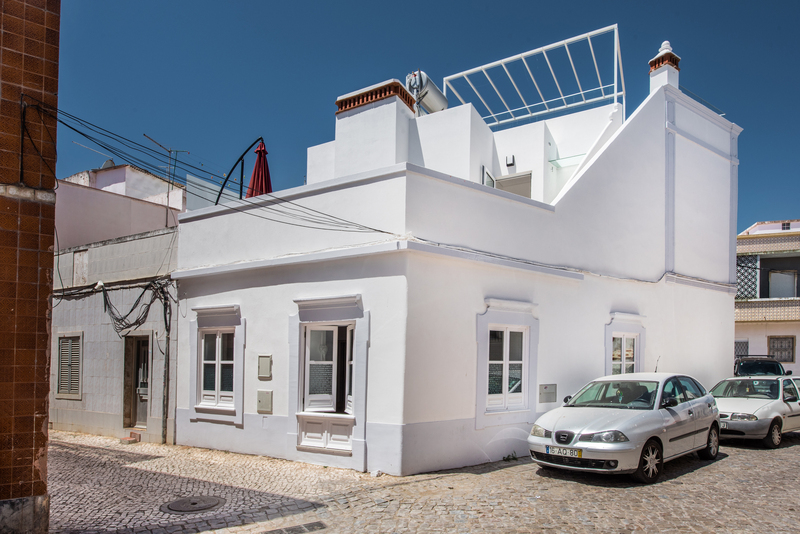 White double doors with large windows on each door complete with traditional wooden shutters and wrought iron work over the windows open into the most wonderful renovated living space if this utterly gorgeous 3 bedroom townhouse. 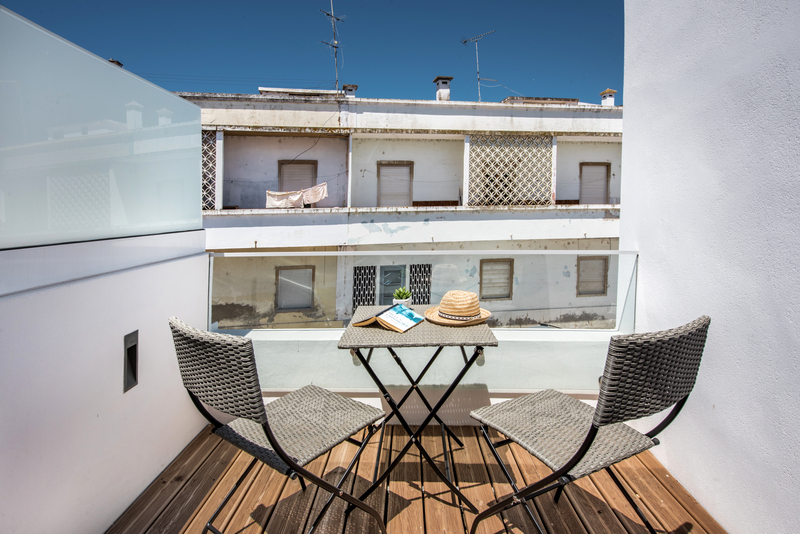 Casa Limoncello is located on a little side street with a mix of old and renovated town cottages and is an end terrace that looks down over the various roof tops to the sea. Once through those amazing doors the 3 bedroom townhouse opens up into an open plan living space. To the left is stone steps up to the first floor and to the right is a kitchen and dining table. 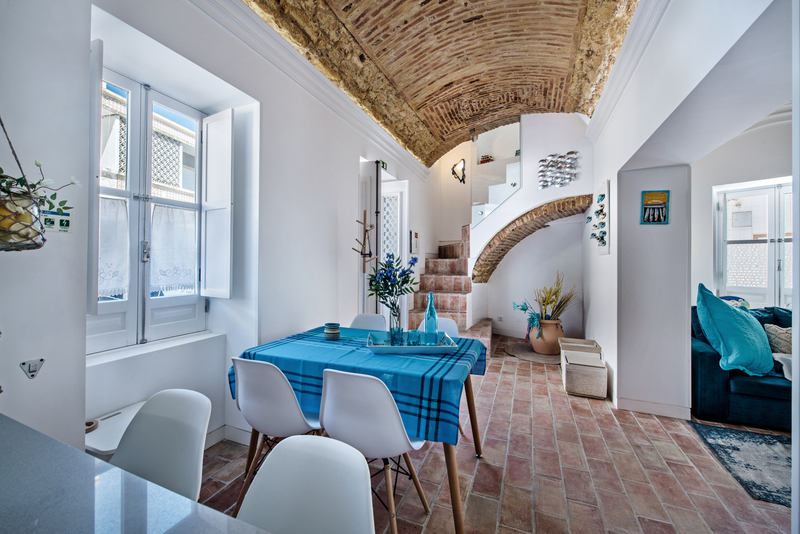 This space is a fantastic insight into how the rest of the house will please you with all its little unusual decor in keeping with the style of Olhao. 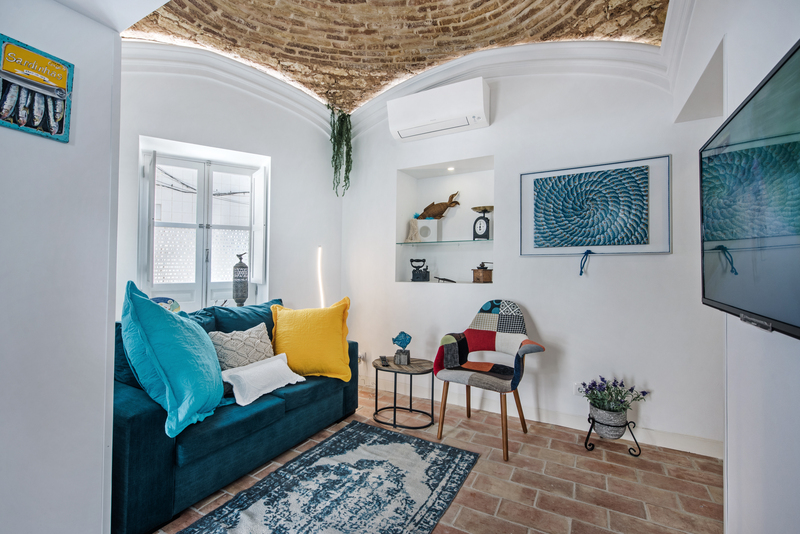 The ceiling is beautiful exposed decorative brickwork set into and arched ceiling very local to house in the East Algarve. Under the stone staircase that wraps around the wall of the house is a n archway featured with the traditional Algarve bricks providing a lovely place to add some colour with plants and terracotta pots. Above the arch and against part of the staircase is glass set as the balustrade making sure light floods into the main room and adding a suer modern twist to the 3 bedroom townhouse. A large window from the front of the 3 bedroom townhouse overlooks the first room and allows thats all important natural light to pour over a table with 4 chairs that makes for a perfect place for dining or breakfast or just sit and enjoy the activity outside through the window. 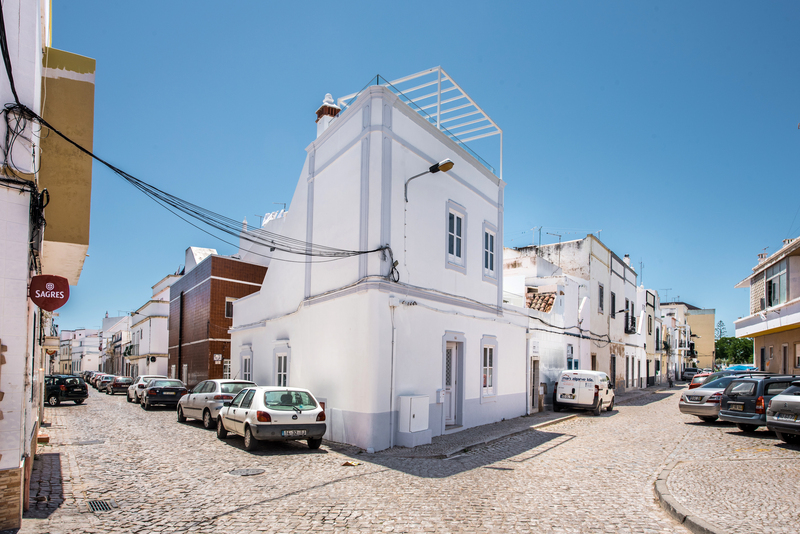 Many of these old buildings in Olhao were built with lots of small rooms. Here a wall has been removed to make an arch way and two rooms make one lovely large area to enjoy. Once through the arch a lovely dark blue fabric sofa with colourful scatter cushions and a novel patchwork chair has been placed to enjoy this space. Against the opposite wall is a large flat screen smart television that offers a selection of European channels. A window overlooks the sofa and is the same design as the other widows with large panes of gals that can be covered by shutters, in summer this help to keep the room nice and cool. A simply stunning uncovered arched brick ceiling with low light around the walls give a really gorgeous feel to the room. 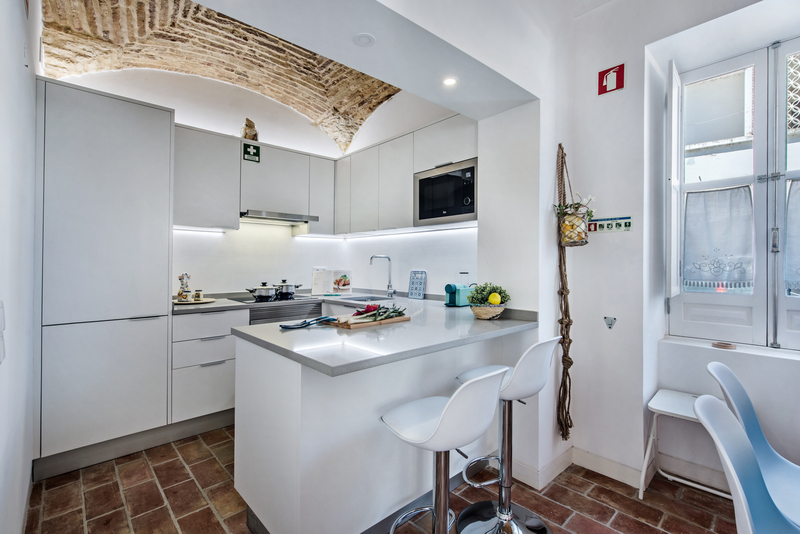 A mix of modern and old come together exceptionally well with the addition of an air conditioning unit that offer s steam of lovely cool fresh air in the hot summer months. 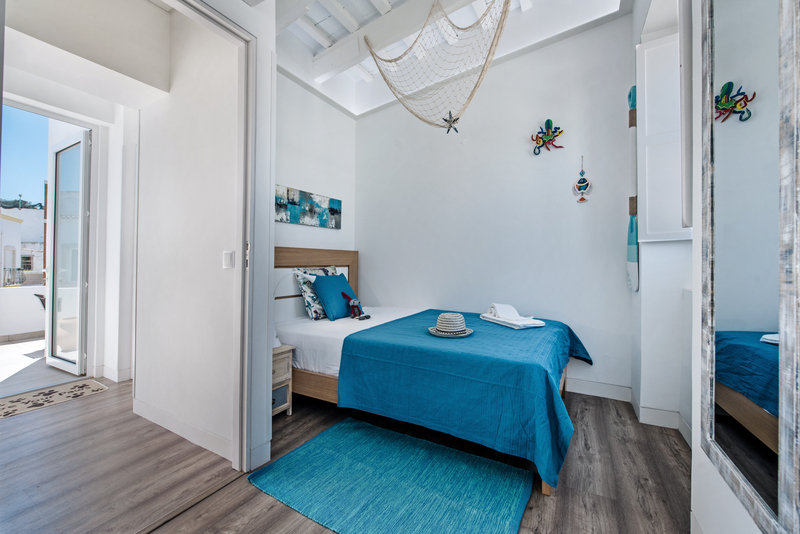 This modern unit also provided a super supply of warmth in the cooler winter months making Casa Limoncello a winning holiday home any time fo the year. Shelves set into the wall are adorned with some wonderful nic nacs that remind you of times gone by from the old fishing town of Olhao. An arch way from the middle of the living space takes you through to a bedroom and bathroom all on the ground floor. 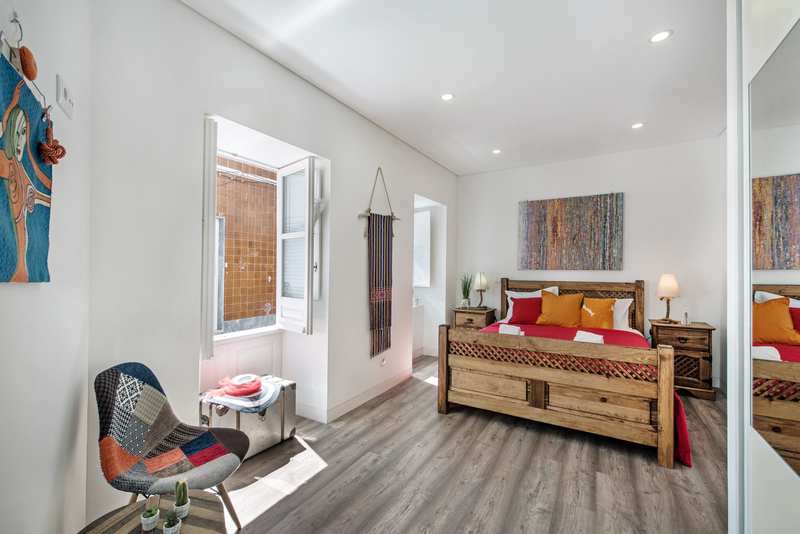 The wonderful living space and ground floor of our lovingly restored 3 bedroom townhouse has white washed walls making it a great to add the different tastes and colours to the space. The flooring is finished with locally made terracotta Santa Catrina tiles that have the wonderful feel of cool in the summer but warmer to the touch in winter. The kitchen is to the right of the main front door and set in to what would have been another small room in this 3 bedroom townhouse, but again a wall has been removed and a wonderful arch has been left in its place. The kitchen is separated from the main room by a breakfast bar with cupboards underneath giving plenty of storage. White and chrome breakfast bar stools are placed to allow a greta place to sit and enjoy company whilst cooking and entertaining. Fitted with ultra modern white fitted kitchen units and very light grey marble work top again the kitchen infuses new with old amazingly well. Integrated appliances include a large fridge freezer, electric oven and hob with a slide out overhead extractor fan, dishwasher and microwave. We have provided a capsule coffee machine, kettle and toaster for you. We have made sure the kitchen is extremely well equipped and you will find plenty of cooing utensils, pots, pans cooking dishes, cutlery, crockery ,cups, mugs and so much more. Olhao is am amazing place for locally grown fresh produce and also locally caught freshest fish and sea food at the daily local markets. In the small side streets you will find amazing bakeries and little grocery shops too. In keeping with the rest of the ground floor look up and see that amazing ornate uncovered arch brick ceiling again, just beautiful! The first bedroom is on the ground floor, accessed via the living space and at the rear of this super 3 bedroom townhouse. Two windows over look a small and quiet back alley and can be used with or without shutters. 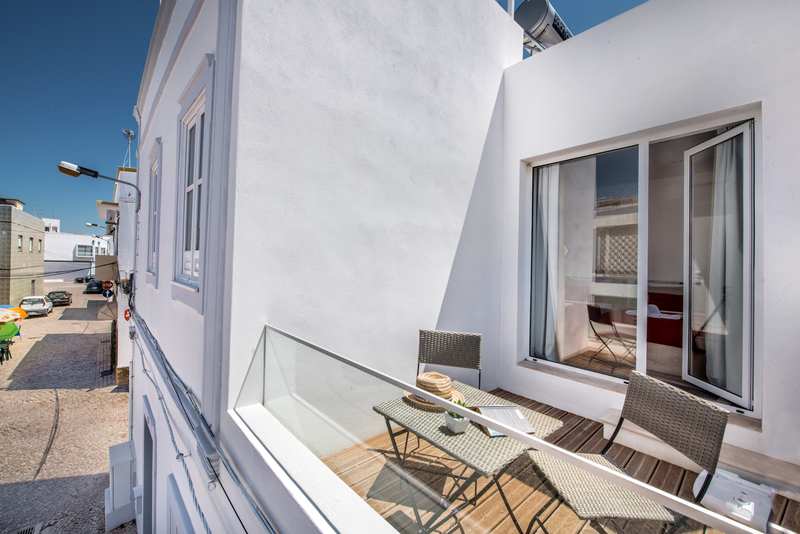 When open they allow plenty of wonderful Algarve natural light to flood in to the room. A large Mexican pine king size bed is super comfortable and made up with lovely fresh crisp white linen. Red and burnt orange cushions and throws add a splash of vibrancy to the bed. Each side is two matching pine bed side units with matching lamps. the white washed walls have been decorated with colourful art and a patchwork chairs sits in the room and keeps the bright colourful them going. Modern fitted wardrobes offer plenty of storage and hanging space. An over head air conditioner gives that all important cool or warm air depending on the time of year. This room has the added feature of an en suite bathroom. 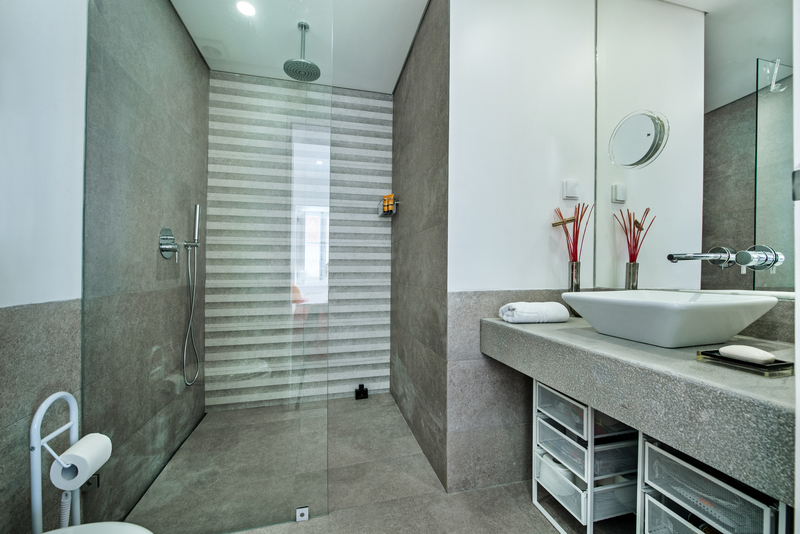 Styled in a grey and marble them the room has a large walk in shower protected by a glass floor to ceiling shower screen. A white ceramic basin is set on to the top of a granite sideboard and over head is a huge mirror, whilst below are little shelves and units to store cosmetics and toiletries, you will find a hair dryer to use here. 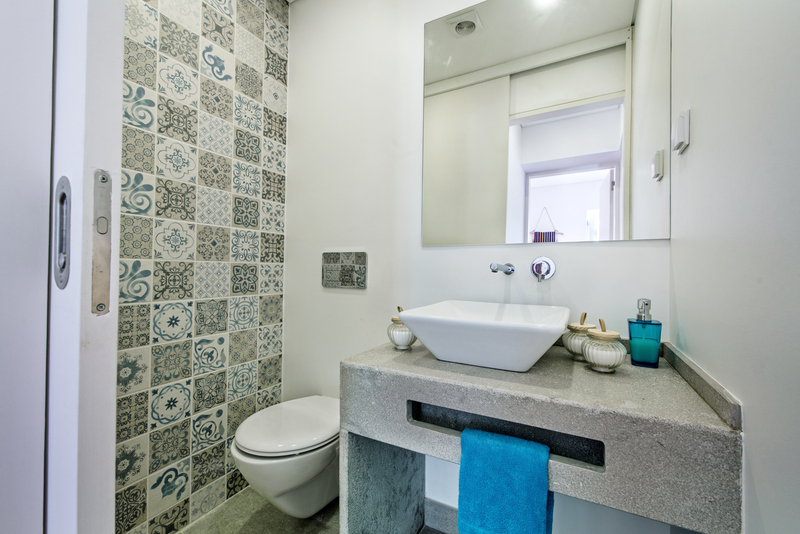 The room also has a white toilet and the wall are mixed white with grey tiles adding a sense of modern chic to the bathroom. The ground floor has the added bonus fo a cloak room with a toilet and basin set in to a sideboard in grey granite. Here is also a feature wall of wonderful patterned traditional Portuguese tiles, really stunning. The other bedrooms are all on the first floor of our 3 bedroom townhouse. Once at the top of the steps to the first floor. To the right is bathroom with a sliding door. 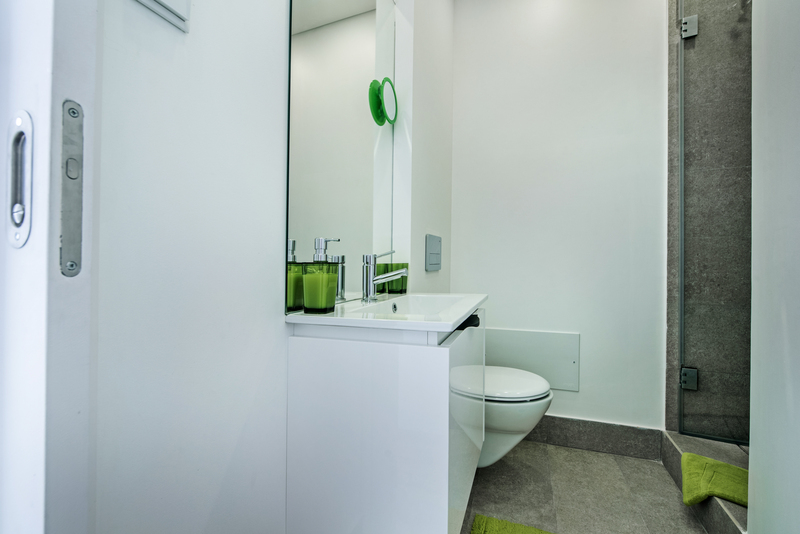 You will find a super modern shower with glass doors and toilet and small basin set into a vanity unit with a super large mirror over head. Decorated in white and grey to again offer that clean modern feel to the room. The vanity unit offers some storage and also here you will find a hair dryer for your use. The second bedroom is a smaller room with a large single/small double bed. and a shelf provide some space for belongings. The third bedroom is really heavenly with two large single beds pushed together making quite a pleasant super king size bed. On each side of the beds are little painted set fo drawers both with modern lamps. Fabulous French windows face out to the front of our 3 bedroom townhouse and open on to a lovely little private balcony with a glass balustrade and decked floor suggesting a nautical them. 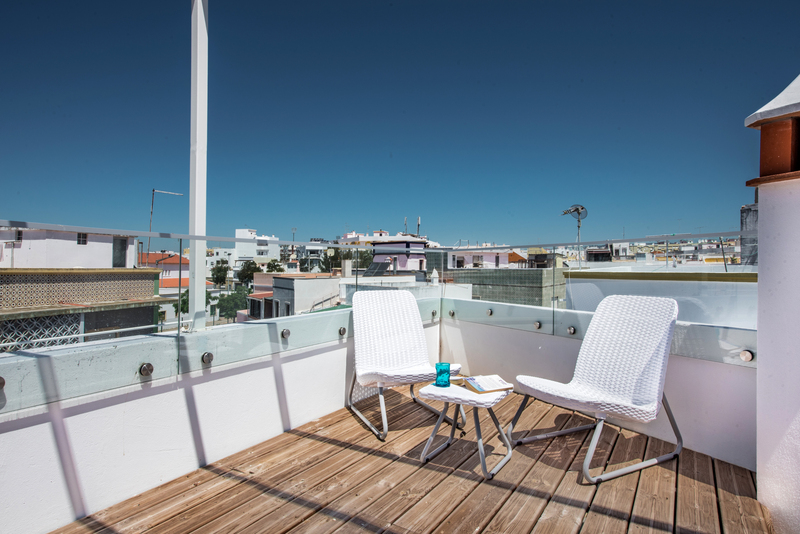 We have placed a table and chair here to enjoy the Algarve climate. Large fitted wardrobes with mirrored sliding doors offer and wonderful place to store clothes and personal items. The first floor enjoys white washed walls and soft laminate flooring giving a sense of comfort under foot. At the rear of the first floor a double glazed glass door leads to the outside spaces. From the first floor a door leads out on to a wonderful terrace surrounded by low white washed walls and pleasant large floor tiles. This space over looks a quiet street below and other little fishermen's cottages in the area. Some renovated, some falling down and some still lived in by old fishermen all adding to the fun and eclectic mix that is Olhao. 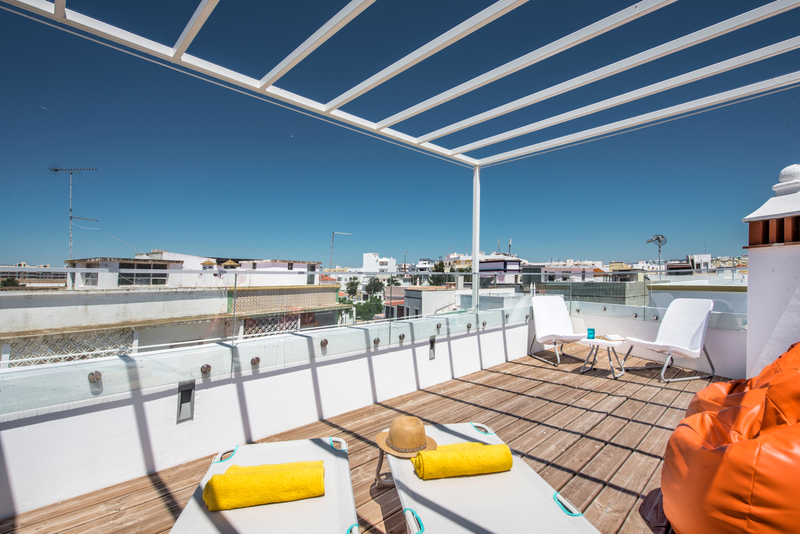 The terrace has a lovely large, modern outside dining table and 6 chairs shaded by a huge parasol that can be either used as shade or closed to enjoy the Algarve sunshine. Along one wall is a built in stone bbq. By far the best way to bbq and much more efficient and pleasing to use than the mobile metal ones we mainly use. 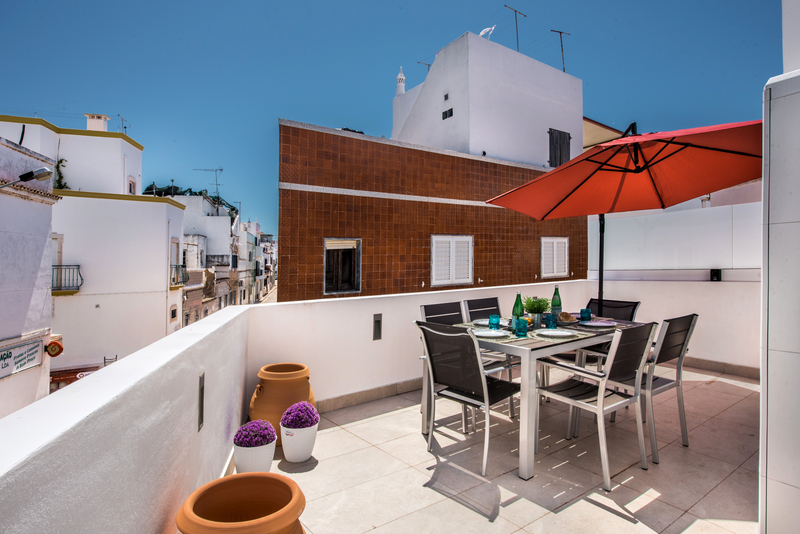 We have also places a small sink and work surface so this really is a great place to enjoy some outside living here in the heart of the East of the Algarve. Just under the steps to the top terrace is a washing machine and facilities to dry washing. Traditional stone steps lead up to yet another terrace. Wooden decking and glass walls give a feeling of luxury and a modern twist to this part of the 3 bedroom townhouse. A pergola offers sail style shading that can be removed but is well needed i the summer months. 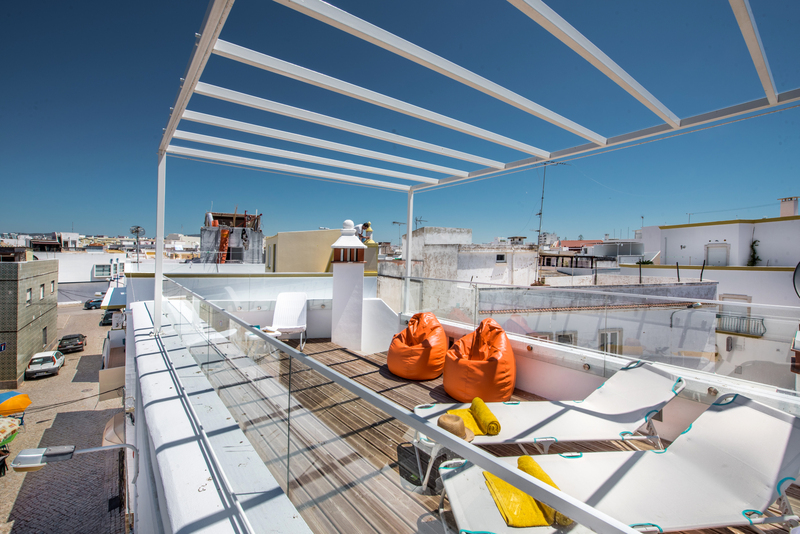 We have added a selection of sun loungers and bean bags to the terrace to provide a fabulous and quiet place to relax at Casa Limoncello. Being that little bit higher again this terrace offers some great views over Olhao and even some glimpses of the Ria Formosa islands. 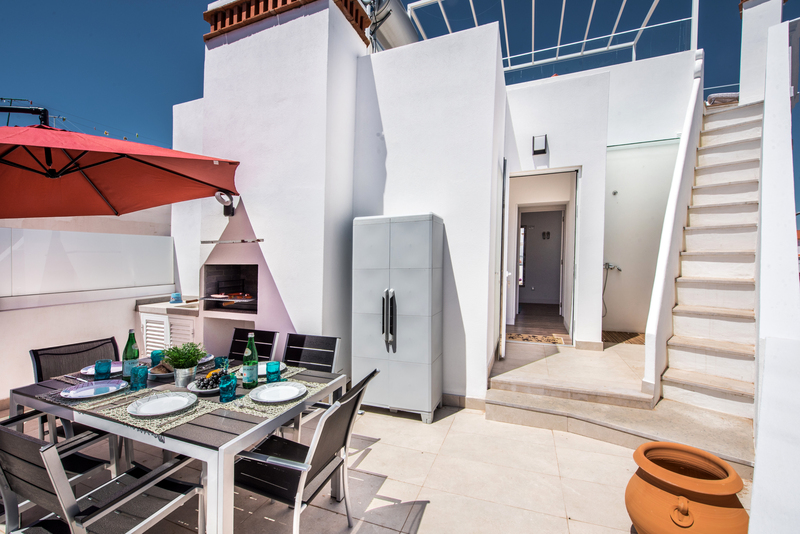 All teh terraces at our 3 bedroom townhouse really add value and make for a simply stunning and enjoyable holiday home any time of the year. 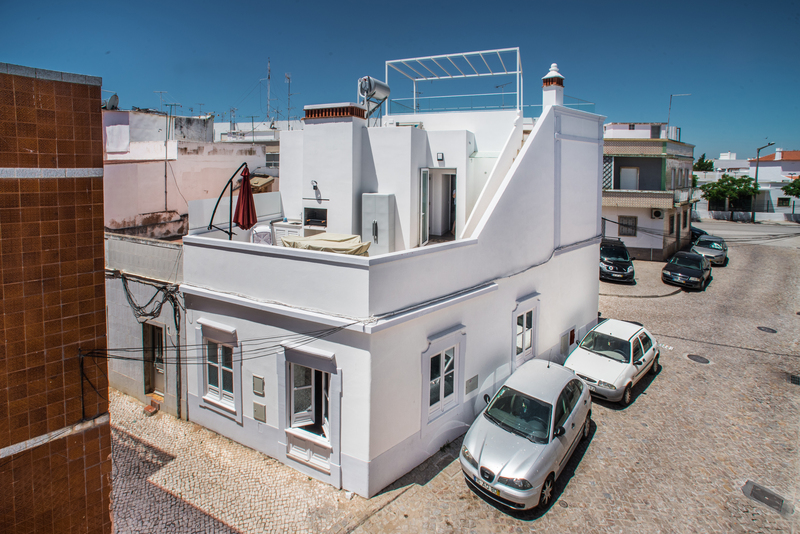 This gorgeous renovated 3 bedroom townhouse is designed to give exceptionally comfortable holiday living whilst still giving the chance to enjoy some of the authenticity of Olhao it is fishing hey day. 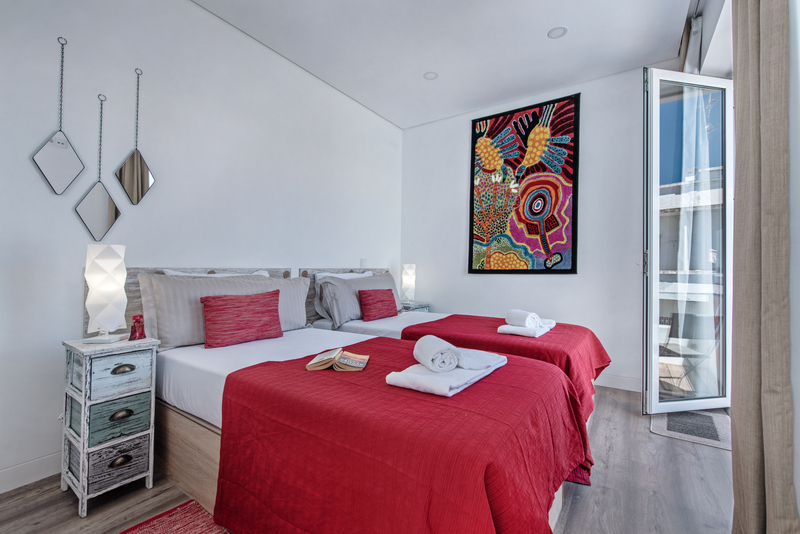 Modern features including a smart fitted kitchen, up to date bathroom facilities, air conditioning in each room and good speed wifi allow you those modern day comforts. 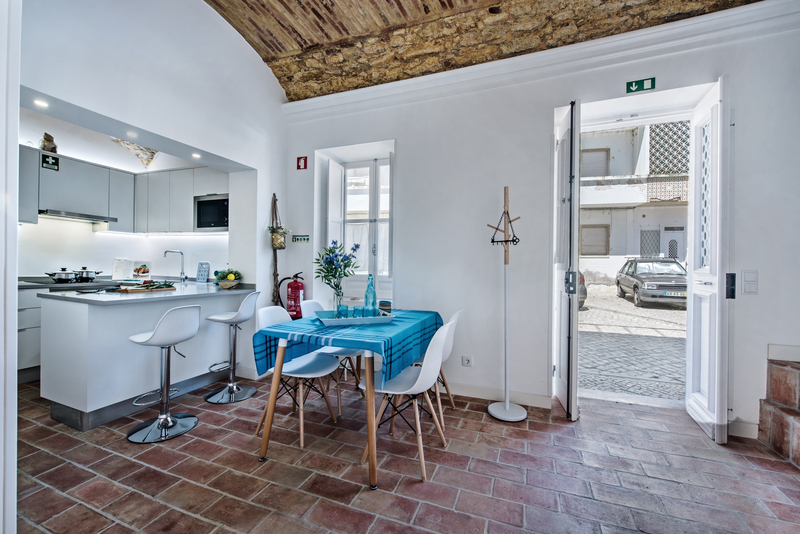 Casa Limoncello is in a great town centre location. There is no need for a car as both the train and bus stations are close by, taxis and Uber are available. A huge choice of cafes, bars and restaurants and are easy walking distance. The sea front and boats to the beaches is less than a 5 minute walk. Our lovely 3 bedroom Townhouse comes with its own manual that you can download to your tablet or smart phone. Packed full of information to make the best of your holiday starting from the moment you arrive. It tells you how to collect the keys, who will look after you during your stay and clear concise directions to Casa Limoncello. Then it is packed full with details of the best restaurants, taxis and local amenities and activities. Perfect accommodation for family of 4 adults. 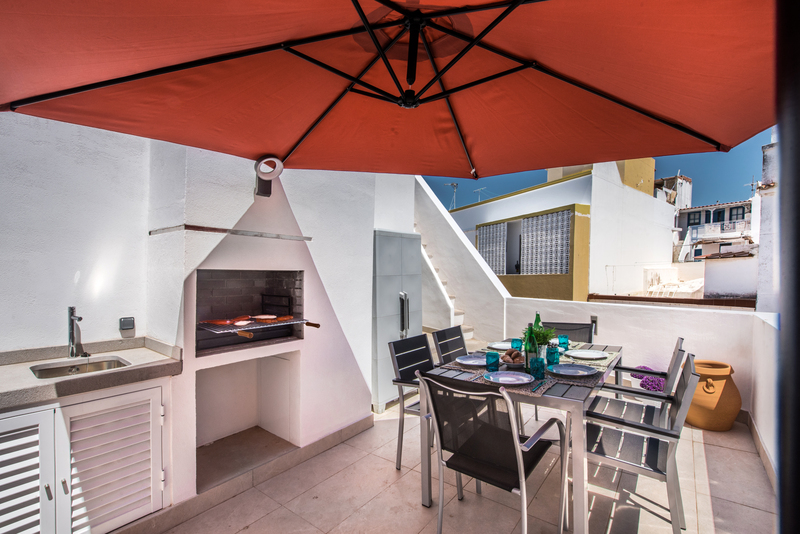 Used all bedrooms and terraces , sadly weather wasn't great so we didn't get to use excellent barbecue. Loved it! ★ ★ ★ ★ ★ Upon arrived the manager was very friendly and more than helpful and gave us a few tips of the area and showed us around the accommodation. A complimentary bottle of rose was left for us. The house has been decorated very nicely with the little touches in keeping with the fishing history of Olhao. It had everything we needed, being british automatically looked for a kettle but you have to boil your water in a saucepan which was no problem at all. You don't need a car to stay here as everything is in walking distance, there is a local shop two seconds walk which supplies a variety of things. The bars, cafes, restaurants, local market and supermarket are all about a 5 min walk, in fact we hardly used our car at all. It was only used to go an visit a couple of places. The locals are very friendly we had many a conversation when walking to the restaurants with three elderly locals who couldn't speak English. 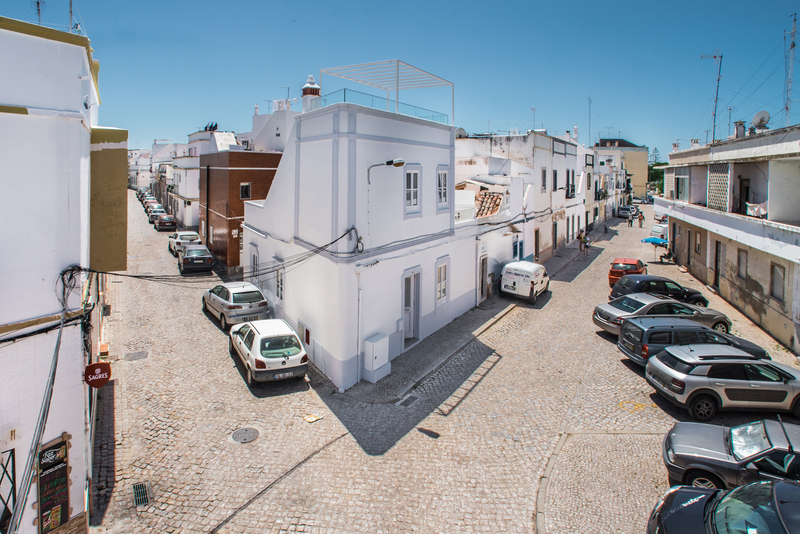 Walking around the quaint quiet streets of Olhao is lovely in some places you can see how it was many years ago. The ferries to the islands are within walking distance as well. 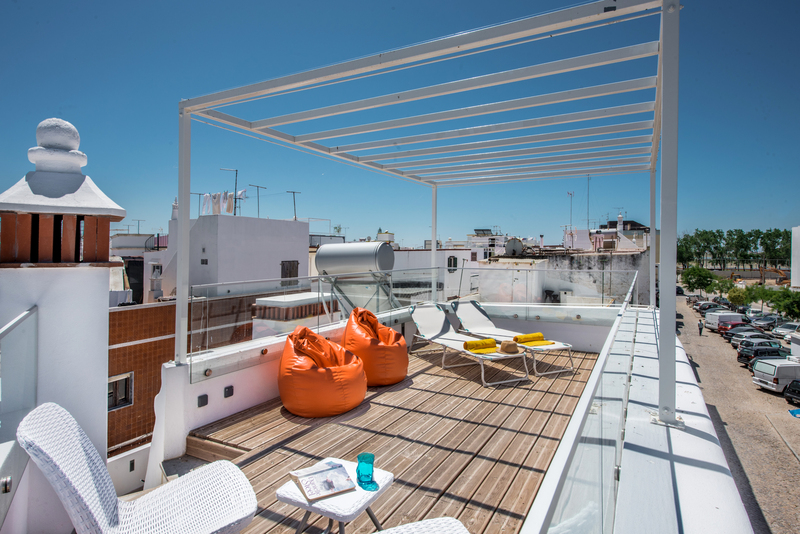 We also made use of the space that the house provided the three terraces which always had the sunshine. If you like to be immersed in local culture and not to experience the loud, drunken noise from the touristy areas this is the place to stay. We loved staying here and we felt we picked the right place to stay. It was not a problem for us but if you have problems with climbing stairs or have young children be aware the stairs to go up to the dining terrace, upper bedrooms and the sun terrace are steep but that is the character of the accommodation. We stayed in the bedroom downstairs as it was cooler at night and didn't need the A/C on. The en-suite shower for this bedroom was fantastic. All an all I loved the accommodation, Olhao and my stay there. I definitely recommend the property and the area.